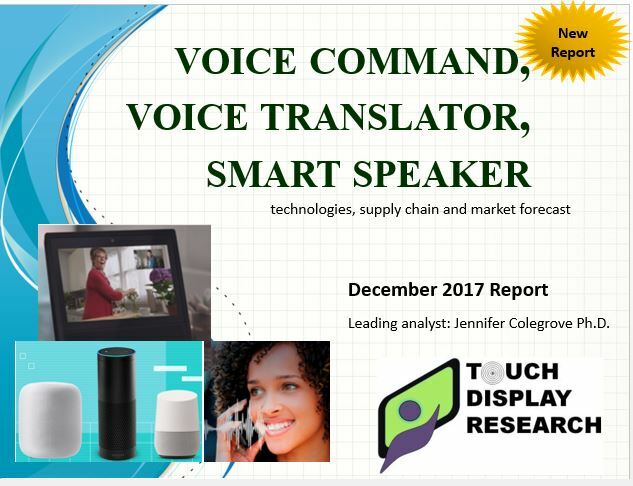 More than 40 smart speaker models compared - Touch Display Research, Inc.
Santa Clara, California, January 2, 2018— In the recently published “Voice Command, Voice Translator, Smart Speaker Technologies, Supply Chain and Market Forecast 2017 Report,” Touch Display Research Inc., a market research and consulting firm, analyzes voice command, voice recognition, speech recognition, (also called voice dictation, spoken dictation, spoken command, voice control, voice assistant, virtual assistant, etc.) voice translation machine, machine learning, and smart speaker devices. More than 300 companies working on voice recognition/ voice authentication/ translation are profiled in the report. 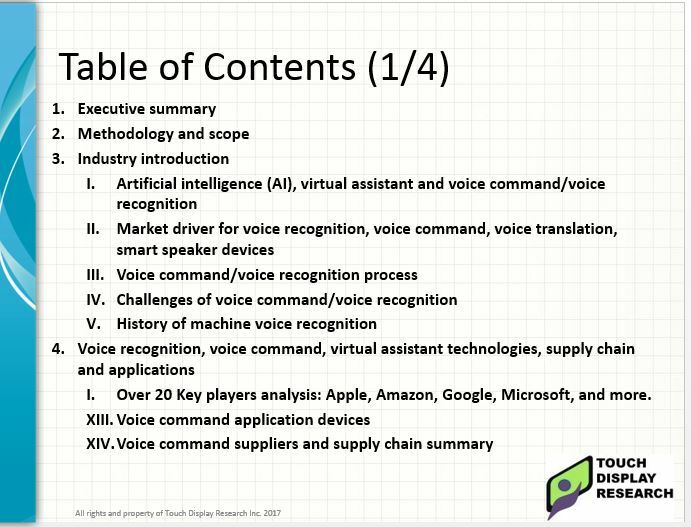 Figure 2: Voice Command, Voice Translator, Smart Speaker Technologies, Supply Chain and Market Forecast 2017 Report Table of Contents (Full TOC and report sample is available upon request). This report profiled over 300 companies working on voice recognition/voice authentication/translation technologies. Colegrove, author of this report, has been writing about touchless human-machine-interaction (including gesture control, voice control) for over 5 years. She performed first hand surveys and interviews with many voice technology suppliers, microphone and speaker suppliers and OEM/ODMs. Touch Display Research, Inc. (www.TouchDisplayResearch.com) is a technology market research and consulting firm specializing in touch screen and emerging display technologies such as OLED displays, quantum dots, flexible displays, e-paper displays, ITO-replacement, Active pen, smart windows, gesture controls, voice recognition, and eye controls. Touch Display Research helps technology companies grow and connecting their technologies to the marketplace. We were the first company to publish Quantum Dot market reports. We were the first company to publish Active Pen market report, and ITO-replacement market report. We have always been there to analyze new and emerging technologies. Touch Display Research provides reports, consulting, and due diligence to touch suppliers, display manufacturers, consumer electronics ODMs/OEMs, material suppliers, investors and venture capitalists. We are member of SEMI, Flextech Alliance, and SID.